1. 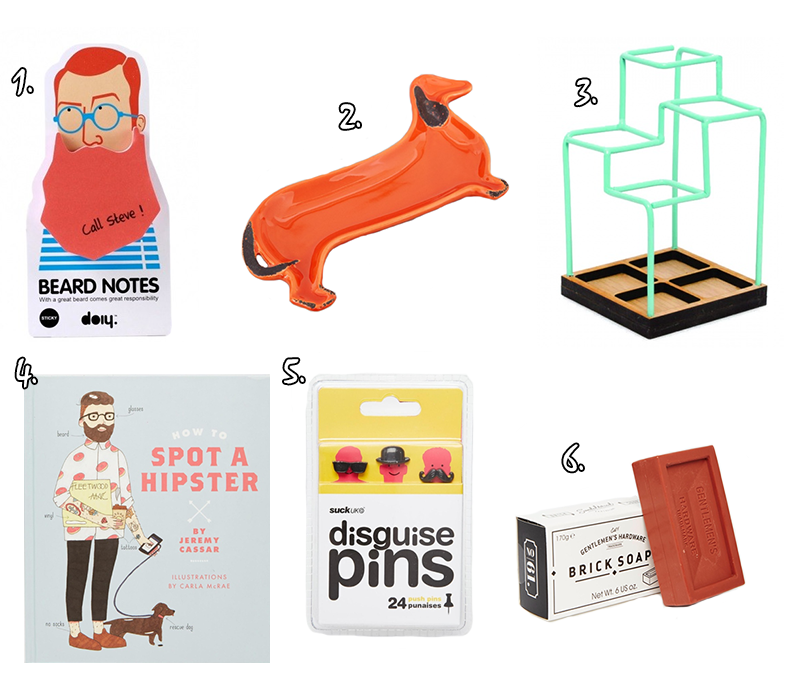 Beard Notes Ginger £3.25 [x] : For the ultimate hipster post it notes, grab a pack of these wonderfully quirky beard notes. I think they're hilarious - although I'd probably just post them onto photos. 2. Sausage Dog Plate £10.00 [x] : If you're looking for a quirky little bit of desk storage then this sausage dog plate might just be for you. Perfect for putting away little bits and bobs like rings or spare change. 3. Sketch Desk Tidy £24.00 [x] : If you're a fan of minimal and edgy design, pick up one of these super cook desk tidys. Perfect if you love bold neon colours. 4. How To Spot A Hipster Book £9.99 [x] : Perhaps it's just me but I love joke coffee table books just like this, as I think they're the cutest things to have lying around - and this one looks hilarious too! 5. Disguise Push Pins Pack £7.50 [x] : If you're looking for a fun way to spruce up your pin board, then this pack of push pins is perfect. The pack includes bow tie pins, bowler hat pins, sunglasses pins, moustache pins and lip pins. 6. Gentlemen's Hardware Brick Soap £10.00 [x] : This bar of soap tries a little too hard to be super manly, but I kind of love that about it. It's the perfect jokey gift for a man who doesn't take himself too seriously. Thank you for reading lovelies! Here's to an amazing week (you got this!). These look so cute, especially the sausage dog plate!